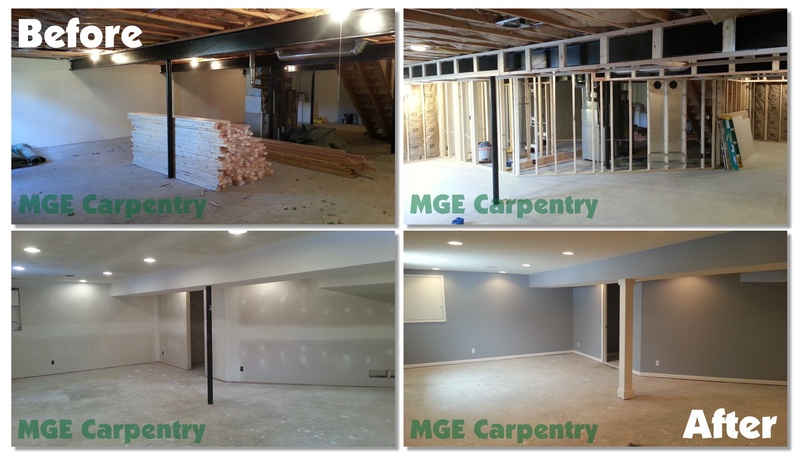 A finished basement is no small task. But we coordinate everything from start to finish. It all starts with a free in home consultation, where we take our measurements, and talk with you about what kind of space your want to create and what you want to use it for. Once we have some ideas, we create a floor plan for your review. Once we agree on a floor plan, we put together a final quote for your project. The initial stage starts with the framing of the basement. From there we do all the rough plumbing, electrical, and HVAC work. We then move into the drywall stage. This is where everything really takes shape. Next step is to install all the trim and doors, and begin construction on any extra items, like bars and kitchens. We then move into the final paint stage, and finish out with the final plumbing, electrical, and HVAC work. There are numerous inspections that happen throughout the project, and also a final building inspection at the end to ensure that everything is done correctly.